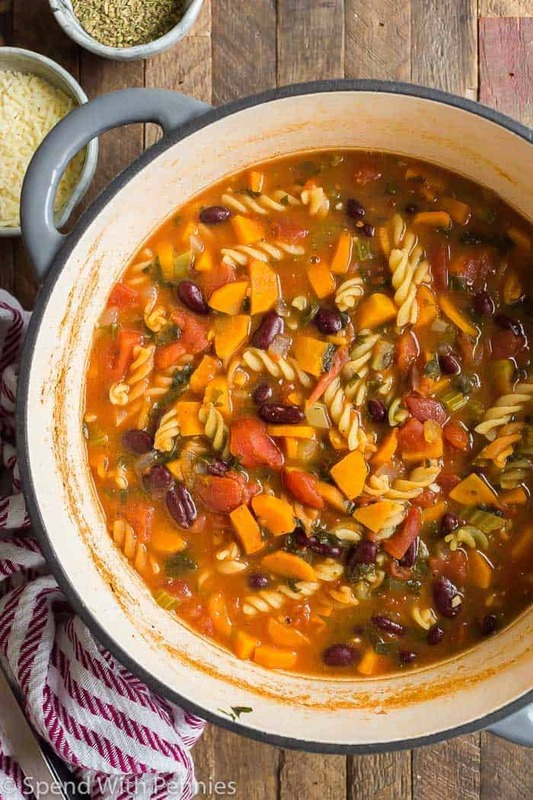 This super easy Minestrone Soup recipe is a one pot meal that is full of vegetables, pasta and an incredible tomato base. It’s the perfect hearty dinner for a cool fall day! This Minestrone soup is one of our favorite soups, and we are soup lovers. It’s quick, it’s healthy, and it’s perfect for dunking with some crusty bread or rolls! 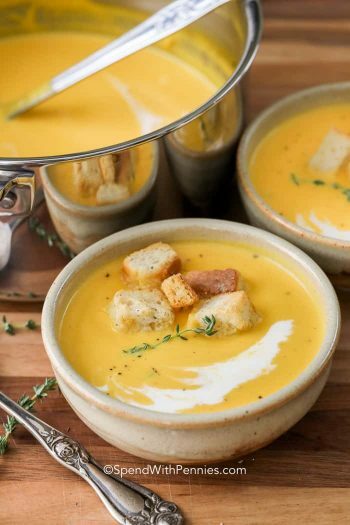 Soup is the ultimate meal for this time of year. The weather is cooling off, the kids are back to school, and the smell that wafts through the house when this Italian Minestrone soup is on the stovetop? This is one of those Minestrone recipes that you can easily swap out the vegetables for some of your family’s favorites or add in extra. If you want it to have a little more staying power, you can even add in extra protein like shredded chicken or ground beef or skip it to make this vegetarian. 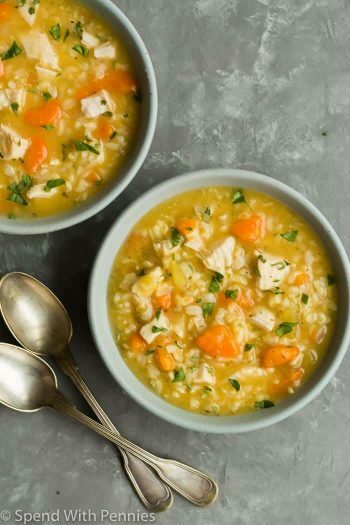 Like a Pasta Fagioli Soup recipe, the leftovers make perfect lunches for school or work the next day, as broth-based soups can hold their heat for a long time in a thermos. I know my kids will gladly go for a change from their typical ham or peanut butter sandwiches! 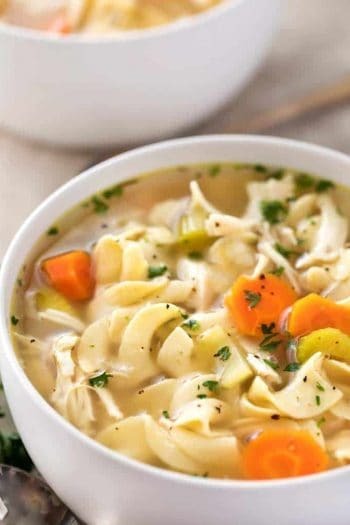 If you love soup as much as we do, you might also enjoy this Instant Pot Chicken Noodle Soup, Slow Cooker Chicken Pot Pie Soup or Turkey Tetrazzini Soup. Flexibility: have you wondered what vegetables to put in minestrone soup? You can mix and match your veggies as you wish! Add in green beans, mushrooms or broccoli if your family is into them (ours is not so much! ), or add in additional proteins, rice, or even a Parmesan cheese rind if you have one left over! 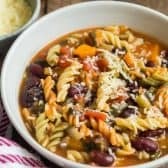 Nutrition: this vegetarian Minestrone Soup is packed with good-for-you vegetables, whole grains and a tomato and broth base, making it a healthy option for a weeknight dinner. 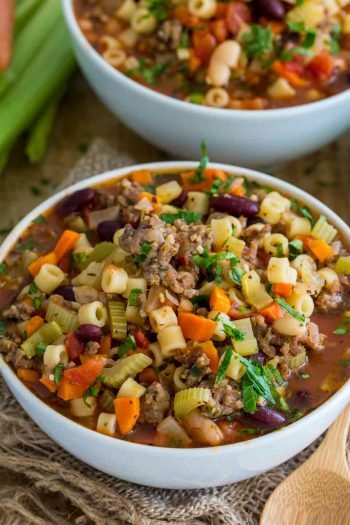 Hearty: we love this hearty Minestrone Soup recipe, which includes beans and pasta in addition to those vegetables we have included. 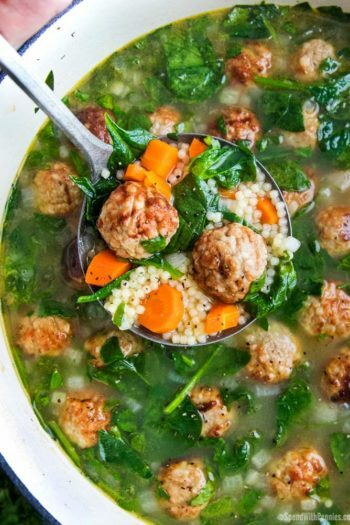 Versatility: you can make this minestrone soup with meat. You could try beef minestrone soup, chicken minestrone soup, or even homemade minestrone soup with sausage. Easy Chicken Taco Soup – SUPER quick! Instant Pot Chicken Tortellini Soup – Easy weeknight recipe! Easy Hamburger Soup – over 400,000 shares! 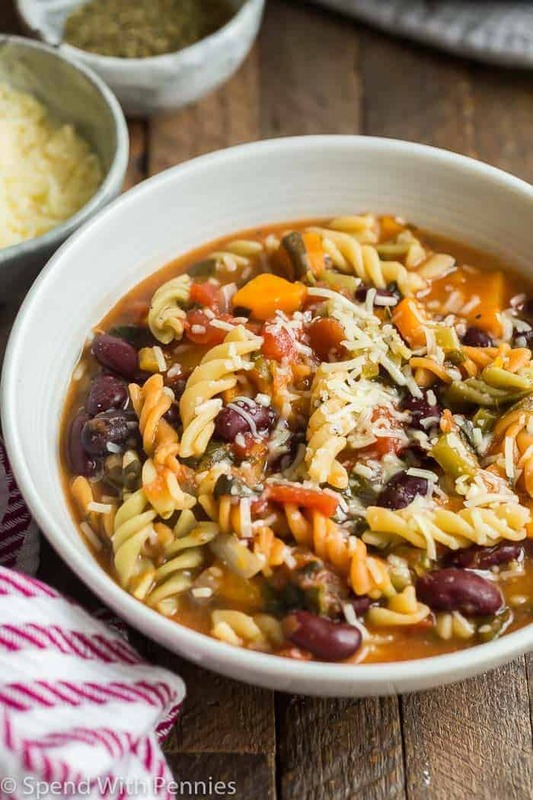 Soup is one of my favorite things to cook in the slow cooker, and it’s easy to make this Minestrone Soup crockpot friendly! 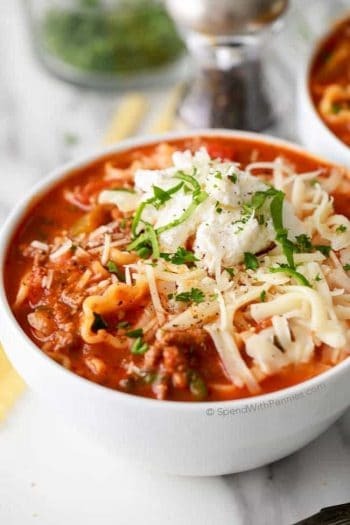 You can simply dump all of the minestrone soup ingredients except for the pasta into the slow cooker, and cook on low for 8-9 hours, or high for 4-5 hours. About 20 minutes before you want to serve, stir in the pasta, cover, and let cook until pasta reaches desired tenderness (this will take anywhere from 10-20 minutes depending on your cut of pasta, so keep an eye on it!). 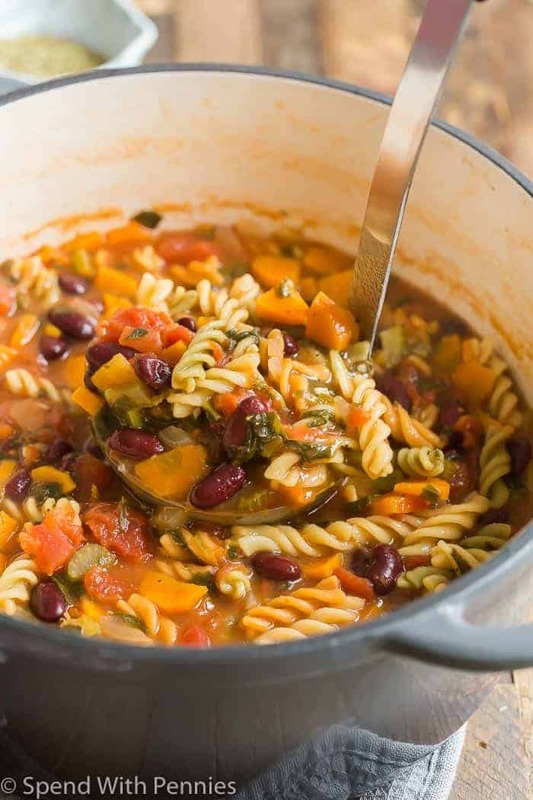 This Minestrone Soup recipe is an easy, one pot meal that is full of vegetables, pasta and an incredible tomato base. It's the perfect hearty dinner for a cool fall day! Add the spinach, tomatoes, broth, and beans. Cover, bring to a boil and simmer over medium heat for 10-12 minutes or until carrots are tender. Add the pasta and stir, cover and simmer for 10 minutes or until pasta reaches desired tenderness. Ashley is a high school teacher turned food blogger and a mother of 3 beautiful girls. She loves to get creative in the kitchen and doesn’t always like to follow The Rules. Ashley shares a combo of healthier main dishes, baked goods and decadent desserts and believes in enjoying all the foods you love in moderation (and sometimes without ;) ).